Odisha is a state in eastern India that's renowned for its unique handicrafts. There are two popular villages you can visit there, where the residents are all artisans engaged in their professions. Unfortunately, with growing tourism to the state, commercialization is setting in. Expect the artisans to repetitively ask you to look at their works, in hopes of a sale or simply some appreciation. Nevertheless, the villages are still interesting places to interact with the artisans, see demonstrations, and of course buy their beautiful handicrafts. Don't overlook bargaining (read these tips for getting a good price)! If you're interested in brightly colored chandua applique and patchwork, then Pipili is the place to go. This village has a long history dating back to the 12th century, when it was established to accommodate craftsmen who made applique umbrellas and canopies for the annual Jagannath Temple Ratha Jatra festival. Back in those days, applique artisans predominantly catered to the needs of temples and kings. Now, you'll find a diverse range of applique items being made in Pipili including handbags, puppets, purses, wall hangings, bedspreads, cushion covers, pillow covers, lampshades, lanterns (popularly used as Diwali festival decorations), and tablecloths. Huge umbrellas are available as well. The eye-catching main street is laden with stores selling handicrafts. Pipili is best visited when traveling between the capital Bhubaneshwar and Puri. It's located just off National Highway 203, around midway between the two cities -- 26 kilometers (16 miles) from Bhubaneshwar and 36 kilometers (22 miles) from Puri. If you're after a more personal experience, you'll enjoy visiting Raghurajpur much more than Pipili. It's smaller and less commercialized, and artisans carry out their crafts while sitting out the front of their prettily painted houses. There are just over 100 households in the village, which has a picturesque setting among tropical trees next to the Bhargavi River near Puri. 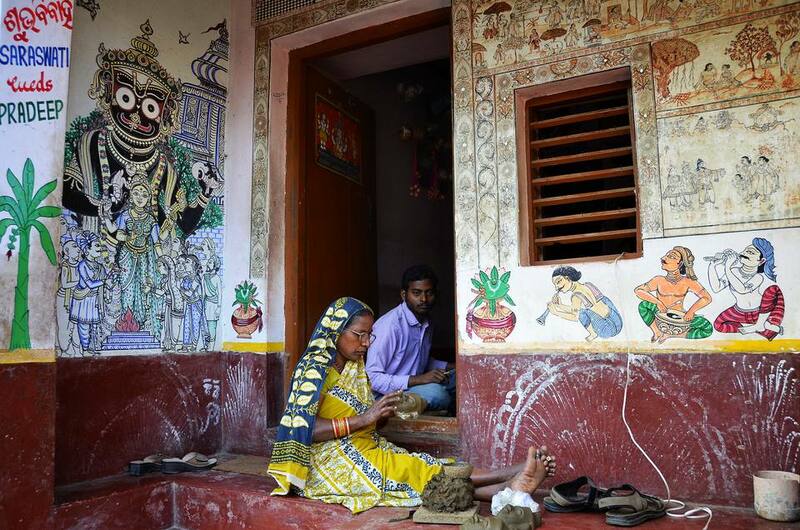 At Raghurajpur, every house is an artist's studio. Pattachitra paintings on cloth, predominantly featuring murals depicting stories from Hindu mythology, are a specialty. Similar to Pipili's applique, this ancient art has its modern day roots in the Jagannath temple and worship of Lord Jagannath (an incarnation of lords Vishnu and Krishna) in Odisha. The artisans make a wide variety of other items too, including etching on palm leaf, pottery, wood carvings, and wooden toys. Many have even won national awards for their work. The Indian National Trust for Art and Cultural Heritage (INTACH) has developed Raghurajpur as a heritage village, selecting it with the aim of reviving the traditional wall paintings of Odisha. The murals painted on the houses are fascinating, although sadly somewhat faded. Some depict stories from the Panchatantra animal fables or religious texts. They will even reveal to you whom has been recently married. Foreigners have been coming to Raghurajpur to learn the village's art forms under the Raghurajpur International Art and Craft Exchange (RIACE) program, every year since 2011. The Bank of India has also brought modernity to Raghurajpur by installing 20 electronic Point of Sale (POS) machines and turning it into a "Digital Village". What is often overshadowed is the fact that Raghurajpur also has an impressive dance tradition. Legendary Odissi dancer Kelucharan Mohapatra was born there and started out as a Gotipua dancer. (This captivating dance from is considered to be the precursor of Odissi classical dance. It's performed by young boys who dress as women and do acrobatics to praise Lord Jagannath). A Gotipua gurukul (dance school), the Dashabhuja Gotipua Odissi Nrutya Parishad, has been established at Raghurajpur under the guidance of Padma Shri awardee Maguni Charan Das. For an extra dose of culture, including Odissi dancing, visit Raghurajpur during the annual two day Vasant Utsav. This spring festival is held in February by cultural NGO Parampara, with Padma Shri Maguni Das as chairman of the festival committee. (Contact Parampara on 06752-274490 or 09437308163, or email parampara1990@gmail.com). Raghurajpur is also located off National Highway 203, which connects Bhubaneshwar to Puri. Turn off at Chandanpur, about 10 kilometers (6 miles) before Puri. Raghurajpur is located a mile or so from Chandanpur. A taxi from Puri will cost about 700 rupees for the return trip. Alternatively, buses going towards Bhubaneshar from Puri will stop at Chandanpur. Odisha Tourism Development Corporation conducts a 2-hour morning tour to Raghurajpur as well. The cost is 250 rupees per person. Be aware that there is a "fake" Raghurajpur, which you will have to pass through just before the actual village. Taxi drivers may claim that this row of shops is Raghurajpur and take commissions from the sellers. If you're feeling active, it's also possible to go on a bicycle tour to Raghurajpur from Puri.